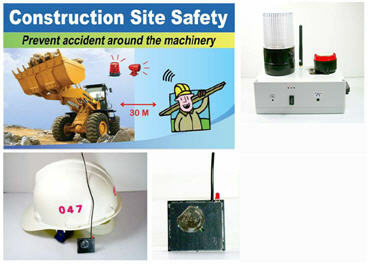 See More Safety Devices Here This is the Helmet mounted transmitter for the Construction Site Safety System please see here for the Vehicle mounted receiver, this tiny (CF card size) transmitter is best mounted inside the safety helmet of your staff and once activated if the wearer approaches any vehicle that has the receiving unit installed the warning light on the vehicle will light up to warn the approaching worker and the audible alarm will sound inside the vehicle alerting the driver that another worker is within the pre-set range of his vehicle allowing the driver to take the appropriate action, one receiver can link to hundreds of transmitters. This simply device can greatly lower the risk of collision based accidents between staff and mobile machinery such as cranes, lorries, earth movers etc making your construction site a much safer place to work. There are no wires to install with this completely wireless system making it very easy to install.